From policy wonks working to effect change to trail builders giving mountain bikers a place to ride to a cyclist helping a friend buy a bike; advocacy comes in many forms. Mary Gersemalina’s version of bike advocacy falls somewhere on that spectrum with a marriage of coffee and cycling. Mary created coffeeneuring, a formalized coffee shop ride series that plays on the rigid rules of randonneuring (Mary is also an accomplished randonneur). Though the whole thing may sound a little odd at first blush, coffeeneuring is catching on and getting people out on their bikes and last year expanded to include participants in Canada, Europe, and Australia. Mary and her husband, Ed Felkerino, are also behind Washington DC’s Friday Coffee Club, a weekly, pre-work event that encourages DC’s bike commuters to stop and get to know one another. 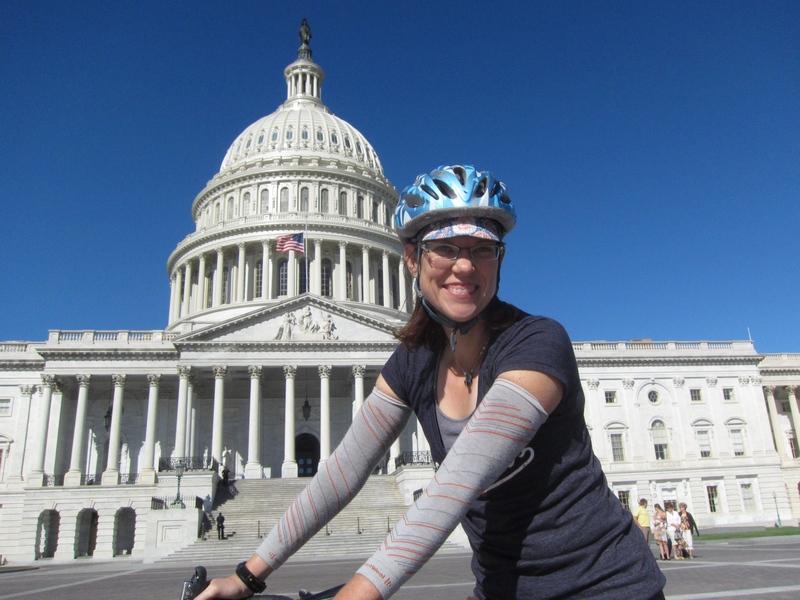 In this interview, Mary discusses her inspiration for coffeeneuring and its quick growth, the impact of Friday Coffee Club, the attraction of 750 mile bike rides, her randonneuring adventures in the US and abroad, and more. What is coffeeneuring and how did the whole thing come about? Coffeeneuring is a relaxed, yet rules-based, cycling challenge where bike riders everywhere are invited to ride their bikes to seven cups of coffee (or tea, hot chocolate, etc.) at seven different coffee locales over a period of six or seven weekends. The Coffeeneuring Challenge began as a result of a series of randonneuring interviews I conducted in 2011 for my husband’s blog, The Daily Randonneur. I was interviewing Joe Platzner of the Seattle Randonneurs, who noted that many people he knew had trained really hard for Paris-Brest-Paris and after PBP he thought it would be great to get a medal for riding slowly to the nearest coffee shop. I too had been training for PBP and thought it sounded like a fun challenge to try to execute via my blog. I invented Coffeeneuring and built a rather long set of rules around it, in part because randonneuring is a sport with many rules and because there is such irony in creating rules around a simple activity like riding your bicycle to a cup of coffee. I launched Coffeeneuring in 2011 not knowing what would happen or if anyone would participate. Twelve people finished the challenge that first year and in 2013 I received over 125 submissions. Coffeeneuring has gone global with participants around the world. Why do you think it’s so attractive to folks? You don’t even have to go to a place that sells coffee anymore. This past year I added a category “Coffee Shop Without Walls” because I did not want people to feel limited to coffee shops or (gulp!) gas station coffee. Coffeeneuring is also a way for people to spend time together and the focus is not on athletic achievement. I saw several people complete the Coffeeneuring Challenge this last year as a “team,” be it a group of friends, a couple, and even as a family. Many people have told me that coffeeneuring inspired them to get out on the bike when they might otherwise have not. Others have used coffeeneuring as a way to reintroduce themselves to riding a bike regularly after a period of not riding. Some people are all about checking out new coffee places in their town. Coffeeneuring works perfectly as a challenge you can share with others through social media as it’s happening. People blog, Instagram, tweet, and share Facebook updates about their rides. The Coffeeneuring Challenge is a way to connect with each other through simply riding a bike to coffee. Paris-Brest-Paris 2011. Photo by Greg Conderacci. You and your husband are also at the center of another coffee and bike based community-builder in DC, Friday Coffee Club. Do you think having a standing, open-invite bike invite like that has had an impact on the DC bike community? Yes! My husband came up with the idea to start Friday Coffee Club, and sent out a tweet to the #BikeDC community about a Friday pre-work meetup at Swing’s Coffee. Swing’s is located right off one of the primary commute routes in the city, the White House Plaza. Ed thought a morning coffee meetup was perfect because people generally can’t linger too long (after all, we’re supposed to go to work), and if they are not having a good time or whatever they can easily scoot off. Friday Coffee Club is a low-pressure activity. Over time it has grown as one of the main BikeDC meetups and it has a steady group of attendees. The first edition of Friday Coffee Club had just five people, but now we’ll have more than twenty people show up. Other morning coffee clubs have sprung up in other parts of the city after seeing the success of the original Friday Coffee Club. I think Friday Coffee Club worked because so many of us knew each other through virtual spaces like Twitter or through reading local bike blogs, but we had never met in real life. Friday Coffee Club provides a space for us all to connect face to face. For me, Friday Coffee Club took away some of the anonymity of the city. I got to know other commuters and now when I see them riding around I say hello. I think more of the BikeDC community knows each other because of Friday Coffee Club. That’s helpful because even though the cycling community in our area continues to grow we are still relatively small when compared with other commuter groups. We really benefit from each others’ support and encouragement, and the informal connections that are made through activities like the Friday meetups. I’m just really amazed that it keeps going strong after more than two years in existence. Long before you invented coffeeneuring, you were a serious randonneur. How’d you get into the sport? I got into randonneuring when I was invited to be part of a friend’s fleche team. I had been riding centuries, but had never ridden more than 100 miles in one go before. The idea of riding 24 hours and covering a minimum distance of 360K intrigued me. I thought, this is my chance to do something new and challenging, and I took it. 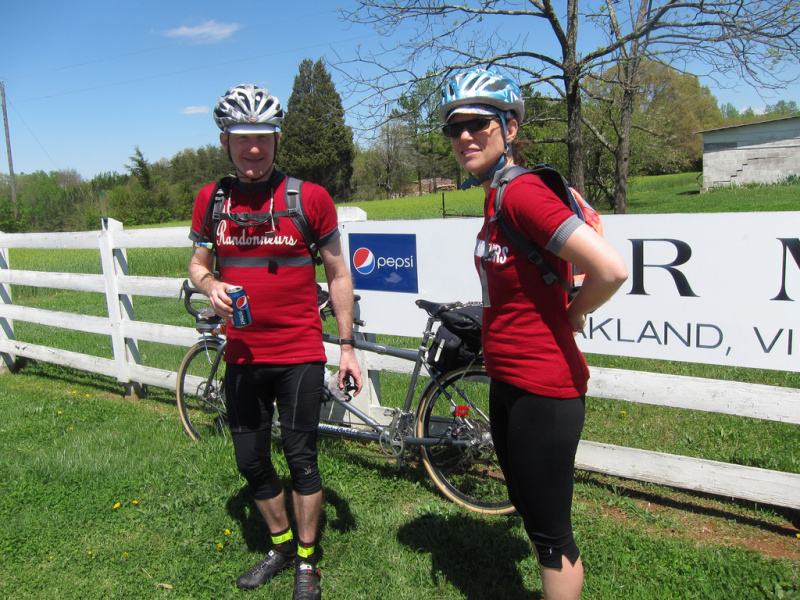 Soon after I began training for the fleche I met my husband through one of my fleche teammates. Ed was an experienced randonneur who had ridden big rides like Paris-Brest-Paris, Boston-Montreal-Boston, and London-Edinburgh-London. I was totally impressed and wanted to do that kind of riding too. We started riding tandem together and in my first year of riding I completed a Super Randonneur series on tandem as well as a fleche on my single. The following year we rode the Cascade 1200K. We kept riding together, eventually got married, and it felt like all my bicycling dreams were coming true. It still feels that way. It’s really a gift to meet a person who wants to do the same kinds of activities you do and at the same intensity. What is it about difficult, long-distance, endurance riding that you keeps drawing you back? I began participating in longer events primarily because I wanted a new goal. I wanted to test my limits and see how my body would fare under more intense physical and mental challenges. So much of my life falls into what I consider the safe and even boring category. Brevets give me a chance to extend the limits of my safe and boring life while still being a relatively tame activity I accomplish on weekends. I like doing brevet training rides with my husband and other friends. It give us something to look forward to on the weekends, a reason to get out of the city and explore, and get us into shape for randonneuring events. I also find that long rides often offer up simple moments of bliss. Those moments are some of my favorite parts of randonneuring. It’s climbing Loup Loup Pass in Washington state with Ed, feeling sluggish and dispirited, and a shooting star flies across the sky. It’s agreeing to stop with our friends at a random gas station in Remington, Virginia, and having a laugh over a pop and potato chips while you sit together on the curb. It’s going up Cameron Pass at 3 a.m. in Colorado with our riding buddies, and stopping our bikes to quietly look up and study the stars. It’s the sensation of riding so many miles and covering so much ground that you feel like you lived two days in one. Someone once told me that we so often have no idea of what our bodies are capable of doing. Through randonneuring and endurance events and the effort of pushing through sleep-deprivation and other physical and mental discomforts, I become more deeply aware of myself. I experience the endorphin release and emotional thrill that comes from weathering whatever a ride throws at you. And at the end of it all, I get a story to file away under life’s great memories. What are some of the highlights from your rando career? As events go, Paris-Brest-Paris (PBP), a 1240K ride which is run every four years, is THE international randonneuring event. PBP is the oldest randonnee, dating back to 1891, and draws thousands of randonneurs from all over the world. My husband and I rode PBP together in 2011 and it was unlike anything I imagined. People cheer you on from the roadsides, towns are decorated with signs welcoming riders, and there is an energy created by this randonneuring event that is like none other. You meet riders from all over and see all sorts of interesting bicycles. 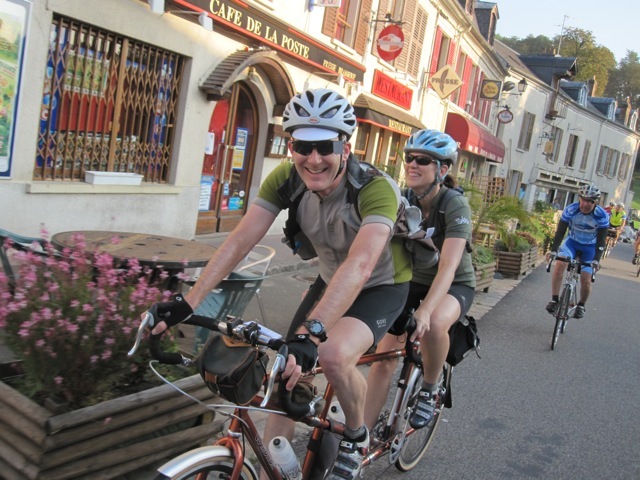 The course passes through a lot of countryside enroute to Brest on the coast, but it is rolling and extremely tandem friendly. This might sound crazy, but there are two times that I recall feeling absolutely beautiful– one of them was my wedding day and the other was PBP 2011. PBP is awesome. My favorite story is from the 2006 Cascade 1200K, hosted by the Seattle Randonneurs. This was my first ride of that kind of distance and back then, everything randonneuring was new to me. I had no idea what to expect on a ride as long as 1200K and no idea how Ed and I would do on a ride that long. We completed that ride in 89 hours, with scarcely an hour to spare. During those 89 hours, we climbed big mountains like none I had ever climbed before (I’m used to the scraggly steeps of the east), descended into a scorching canyon that required us to stop riding in the middle of the day because it was so hot, and experienced the updraft rushing out of the Columbia Gorge pushing on our tandem like nothing we’d ever felt before. Through that ride I learned that Ed and I are a solid team and I have an intense will to finish rides that eclipses momentary discomforts. I do have to give a shout-out to the Colorado High Country 1200K, which is run by John Lee Ellis in Colorado. It is a beautiful and well-thought-out course that propels you forward, mile after mile. 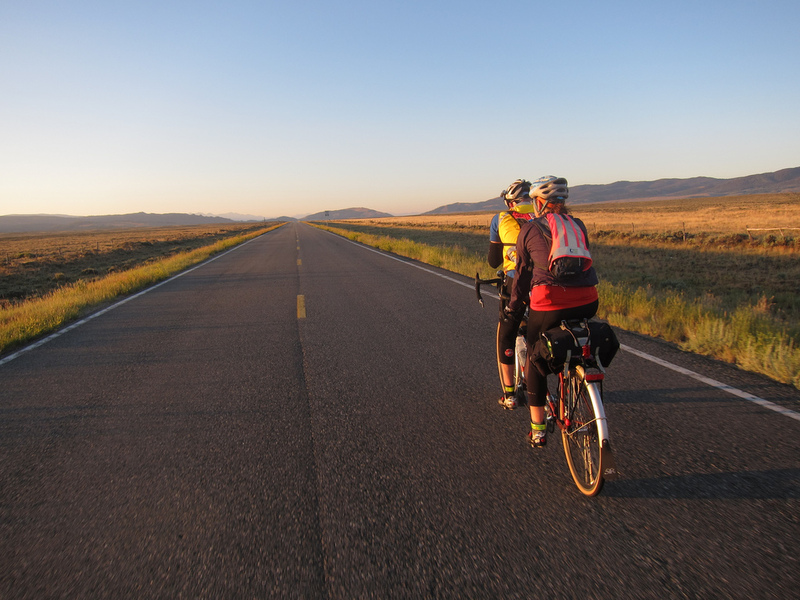 You climb big mountains, go through canyons, pedal through many miles of big sky country. During the 2012 edition of the Colorado High Country 1200K, the weather was perfect. We also rode much of the route in the company of good randonneuring buddies, which made it extra special. Colorado High Country 1200km. Photo by Bill Beck. You’ve done a ton of brevets now, including some of the biggest and most historic. What’s next on your cycling bucket list? We both have our sights set on riding PBP again in 2015. I also want us to set aside more time for bike touring over the next few years. I dream of riding along the Mississippi River around parts of Iowa (my home state) and up into the Wisconsin Dells, and Ed and I have both discussed the appeal of touring the Sierra Cascades in Washington and California. This entry was posted in Advocacy, Interviews, Randonneuring and tagged bikeDC, coffeeneuring, dc randonneurs, friday coffee club, randonneuring, women and cycling. Bookmark the permalink. Great blog Mary! Read the whole thing and liked the pictures very much. Great story! I discovered Mary (whom I think of as “Chasing Mailboxes” because that’s her blog title and used to be her Twitter handle) as I compiled the list at womenbikeblogs.com. Coffeeneuring spoke to my coffee-loving heart and I wrote it up on my personal blog in 2011, although I was writing after the actual timing of that first one (http://bikestylespokane.com/2011/10/08/coffeeneuring-fueled-by-caffeine/). It wasn’t until I read this that I realized it had just gotten started that year. The funny small-world coincidence was when I joined Washington Bikes, where Joe Platzner served on the board, and discovered he had helped inspire the idea. I’ll mark my calendar to make sure I complete the coffeeneuring challenge this fall. Great profile, Mary! Your writing and sense of adventure, fun and organization continue to inspire. I’m honored to have been a member of the first twelve coffeeneurs and look forward to continuing this fine tradition as it grows. Hearing that PBP marks one of your finest and most memorable life experiences brings me joy as I anticipate PBP 2015. Onward!